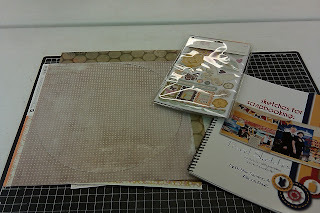 Last night was my first night at Whole Lotta Scrap's Basic Grey class! My fun friend, Miss Coworker Chris, told me about the class and asked me to go- well, I love BasicGrey and how much do I love WHOLE LOTTA SCRAP?! Seriously- have y'all been to this store? It's HUGE. It's like the Mega-Mart of Oklahoma scrap. The store is big. And it's filled with the newest, latest, and greatest- every scrappy item you could ever want to buy and rub all over your naked body. The owners are great, too! I don't know about you- but when I go into a store, I expect to be treated like the celebrity that I am- and they know how to treat a visiting dignitary. Oh, you wanted to know about the class- not just about how popular I'm not. First of all- to get to the class, we had to leave work right at 5pm. Whole Lotta Scrap (I love saying the name of this shop- it's fun. Say it. Say it again. Now say it like you mean it) is in Norman. Which is, per Marjorie, my navigation unit, is about 27.46 miles from my place o'bidness. That's a helluva drive. I can't even say what kind of drive it is during rush hour traffic. But thanks to Marjorie, we made it there in a record 43 minutes. During rush hour traffic, from work to the sorta-East side of Norman in 43 minutes? It can be done. I haven't totally finished my two page layout from the class- but it's almost there... I had lots of fun, using my new Ingvild Bolme Distressing Tool and my beloved Picket Fence Distress Stain to customize my layout in my own fun Kory way. I also threw some twine into the mix, in the style of the GREAT FRANK from The Haus of W! As soon as it's complete, I'll hafta take a picture! The great thing about the class was that we were free to do the layout how we wanted to do it- we didn't have to follow and exact plan. I loved being able to just do what I wanted- and it also helped that we were free to get up and shop! You know how I love to buy things- so you wanna know what I got? I picked up another template from The Crafter's Workshop, a set of blank chipboard shapes, a small brick wall stamp from Prima, and what I really wanted, and have been wanting since I first saw them: Graphic 45's new stamps, 'Olde Curiosity Shoppe Two.' This set is the ones you can see here, at Scrapbook.com. Did you take a look? If not- it's the set with the old bottle stamps. These are great! I'm already coming up with all kinds of fun ideas for these little effers. Also, right before the class, the very nice Vickie from Okienurse's Paper And Ink Therapy, came up to me and said hi! She is great- check her out! Alright, I got work to do- I can't sit here all day talking to you. But I mean that in the kindest way. See you later! I am jealous that there's not any super awesome scrapbook stores nearby me!!! Aww, I'm sorry, too! Everyone needs great stores nearby! I don't know what I'd do without them! Looking forward to seeing your layout. I love those stamps by graphic 45! I'm loving them more and more! I played with them last night- cant wait to come up with something to use them on! WLS is such an awesome store, I love it. They have MY kind of stuff there, which I love. And it was the first (and only) scrapbook store I've seen with a photo printer machine. Last time I was in, I dropped off 3 huge bags of purged supplies there in the crop room. One lady was digging through it before I was even done in the store. :) I figure that's what I'll continue to do with my purged supplies. I don't know what to say- you can choose a treadmill over ME and WLS?!?! How awesome, a BasicGrey class, you are lucky!!!! OH MY Twine? I am crazy for twine!!!! I CANNOT WAIT TO SEE IT Kory!!!! Post it soon!!!! I wanna see! Love those G45 stamps too!! Way cool!